This note on A and C Weighting via bilinear transform is closely related to “ON LEVEL MEASURMENTS VIA ITU-T P.56 AND WEIGHTING” (cf. Ref. ) and elaborates on the standard definitions of weighting curves A and C (defined in the analog domain) for the purpose of unbiased digital filtering when taking advantage of bilinear transformation (cf. Ref. ). A common approach to filtering signals using A and C-weighting filters is to employ the bilinear transformation directly (cf. Ref. ). It is also known that such an unqualified approach leads to discrepancies between versions of A and C-weighting and the ones obtained via the bilinear transformation. These descrepancies are caused by the non-linearity of the transformation itself. Figure 1 illustrates the mapping between the frequency variables ω and Ω resulting from the bilinear transformation (5). It should be noted that the spectral approach (cf. Ref.) does not lead to any discrepancies of similar nature due to the fact that it does not synthesize a digital IIR filter from its analog prototype using the bilinear transformation. Instead, it uses the DFT, and, specifically, the FFT-based approach, which allows for a direct employment of the original definition of the weighting curves. The only limitation of that approach is associated with the size of the DFT when the input file is large. To overcome that limitation, a modified approach would require the input vector be segmented into smaller pieces. This in turn would require an application of careful concatenation of the output segments to preserve their initial conditions (thus to avoid discontinuities in the concatenated signal). The approach discussed here is tied to the original approach, i.e., the one via synthesis of the IIR digital filter through the bilinear transformation, with one addition though: in order to minimize the nonlinear effect of the bilinear transformation, the input data needs to be upsampled and then, after applying the weighting filter, decimated. With that approach, the non-linearity of the bilinear transformation can be adequately mitigated (albeit never removed completely). where ω is the angular analog frequency (i.e., ω = 2 πf) and Ω is the corresponding digital frequency. 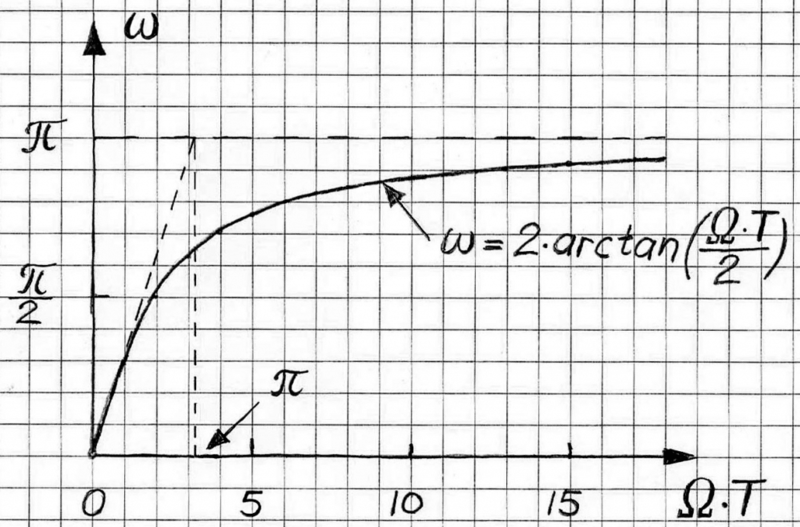 This nonlinear skewing effect is called a frequency compression or frequency warping, and it is due to the nonlinearity of the arctangent function (cf. Ref. ). We notice though that for frequencies in the neighborhood of zero, the linear approximation can be applied. Therefore, in order to overcome, or rather mitigate, the frequency warping effect, before filtering the signal using the A- weighting filter or the C-weighting filter via the IIR filters generated based on the analog prototypes, it is recommended first to upsample the signal, then filter it and then downsample it by the same factor. From the practical viewpoint, upsampling and downsampling by the factor of 2 is adequate in the most cases. 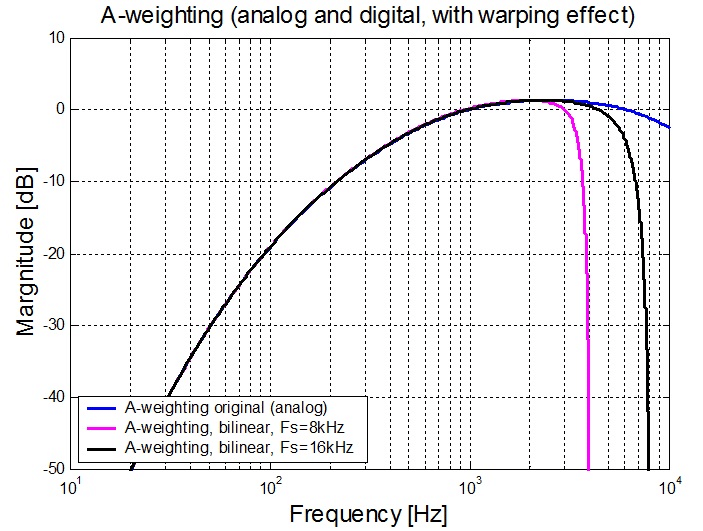 If the signal energy is concentrated in the upper end of the frequency scale, particularly in the close vicinity of the Nyquist frequency Fs/2, the upsampling and downsampling by a greater factor (say, 4) will further reduce the warping effect. Closer examination of Figure 1 as well as Equations 6a or 6b leads to more definite estimation of the adequate resampling factor for the given signal. 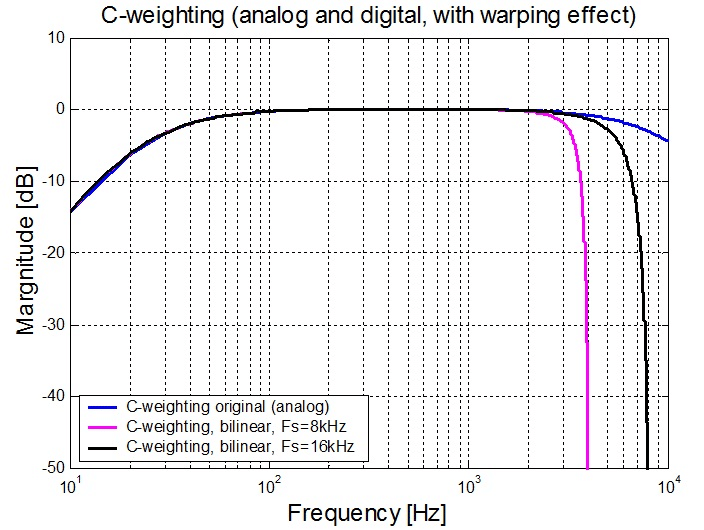 It is worth noting that for the most cases when the signal spectrum extends from the low frequencies through the upper frequencies (as opposed to the cases where it is concentrated mainly at the higher frequencies), the warping effect impact on the level estimations is greater for the A-weighting than for the C-weighting, for the same sampling frequencies. VOCAL Technologies practices include standard compliance with A and C weighting both in analog as well as digital domains. Contact us to discuss your application with our engineering staff.